Recruit a business associate, peer, or friend as a new NAMA member before November 5 and both of you will be in a drawing for a new GPS! Tell your friends, peers, and business associates how you benefit from being a member of NAMA – the learning and networking opportunities, skill development, access to agribusiness solutions, etc. Every NAMA member who recruits a new member between now and November 5 will be included in a drawing for a new GPS. The more new members you recruit – the better your chances. New members will have their names entered, too. Simply tell your recruit to join on-line at http://www.nama.org/join.html and include your name in the “Referred by” box or have them call the NAMA office at 913-491-6500 to join and remind them to say they were referred by you! Be sure to tell them they’ll be included in the drawing. When will the drawing take place? During Trends in Agriculture, which takes place November 11 and 12 at the Hyatt Regency Crown Center in Kansas City. We’d love to have you there, but you don’t have to be present to win. The goal of the NAMA Advocate program is to enlist a core group of NAMA members to help recruit new members and advocate for the organization. The NAMA Advocate program is part of the overall “Cultivating Connections” membership plan. Your efforts are part of the bigger membership picture. The national NAMA membership committee is working with chapters on recruiting while simultaneously the NAMA office is working on targeted prospecting. With recruiting efforts in place at the local and national level, we hope to increase NAMA membership over the course of the year. It is important as an advocate, that you work with local chapters and the NAMA office and, likewise, you have support when you need it. Along with the satisfaction of helping the organization you’ll be recognized in the NAMA News section of AgriMarketing magazine, and in the National NAMA e-news. You’ll be recognized at the Agribusiness Forum and the Agri-Marketing Conference with a ribbon on your name badge. You will also be invited to the “First Timer/Leader” event at the conference. Kara McDonald, Dairy Management Inc.
Cyndi Treadway, Exhibit Resources, Inc.
Sign up today be a NAMA Advocate at http://www.nama.org/advocate/advocatesignup.htm. NAMA is launching a membership promotion and as a NAMA member we wanted you to be aware. 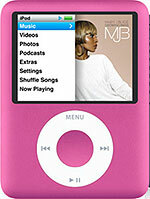 New members who join NAMA between January 1 and April 7, 2008, will be entered into a drawing for a 8GB iPod NANO. In addition, existing NAMA members who recruit these new members will also be entered into the drawing. Just make sure when you recruit a member that they put your name in the “referred by” space on the membership application. The drawing for the iPod will take place at the Connection Point Closing Reception on Thursday, April 17 at the 2008 Agri-Marketing Conference, but you need not be present to win. Help beef up the NAMA membership with the latest membership promotion. During the month of November, recruit a business associate, peer or friend to the benefits you enjoy as a member. Every NAMA member who recruits a new member in the month of November will receive a $25 gift certificate to Omaha Steaks! Simply tell your recruit to join on-line at http://www.nama.org/join.html and include your name in the “Referred by” box or simply have them call the NAMA office at 913-491-6500 to join and remind them to say they were referred by you! NAMA is proud to announce 2 new additions in the Advocate Program. The goal of the new advocates is to help recruit new members and advocate for the organization. For a complete list of NAMA Advocates visit, http://www.nama.org/advocate. If you are interested in becoming an advocate, you will receive membership materials from the NAMA office to help you get started. In addition, you will get the satisfaction of helping the organization and you’ll be recognized in the NAMA News section of AgriMarketing magazine and NAMA e-news. You’ll also be recognized at the Agribusiness Forum and the Agri-Marketing Conference with a ribbon on your name badge. You will also be invited to the “First Timer/Leader” event at the conference. Start advocating today! Sign-up at http://www.nama.org/advocate/advocate. Along with the satisfaction of helping the organization you’ll be recognized in the NAMA News section of AgriMarketing magazine, NAMA e-news and Grassroots newsletter. You’ll be recognized at the Agribusiness Forum and the Agri-Marketing Conference with a ribbon on your name badge. You will also be invited to the “First Timer/Leader” reception at the conference. Along with the satisfaction of helping the organization you’ll be recognized in the NAMA News section of Agri Marketing magazine, and in the National NAMA e-news. You’ll be recognized at the Agribusiness Forum and the Agri-Marketing Conference with a ribbon on your name badge. You will also be invited to the “First Timer/Leader” event at the conference. NAMA is proud to announce 3 new additions in the Advocate Program since the beginning of summer. The goal of the new advocates is to help recruit new members and advocate for the organization. If you are interested in becoming an advocate, you will receive membership materials from the NAMA office to help you get started. In addition, you will get the satisfaction of helping the organization and you’ll be recognized in the NAMA News section of AgriMarketing magazine, NAMA e-news and Grassroots newsletter. You’ll also be recognized at the Agribusiness Forum and the Agri-Marketing Conference & Trade Show with a ribbon on your name badge. You will also be invited to the “First Timer/Leader” reception at the conference. Start advocating today! Sign-up at http://www.nama.org/advocate/advocatesignup.htm. Cultivate your connections! Become a NAMA Advocate and help grow membership! NAMA is launching a new program to increase our member numbers. The goal is to enlist NAMA members to help recruit new members and advocate for the organization. What will you get in return? Along with the satisfaction of helping the organization you’ll be recognized in the NAMA News section of Agri Marketing magazine, NAMA e-news and Grassroots newsletter. You’ll be recognized at the Agribusiness Forum and the Agri-Marketing Conference with a ribbon on your name badge. You will also be invited to the “First Timer/Leader” reception at the conference. Sign up now and start advocating today!